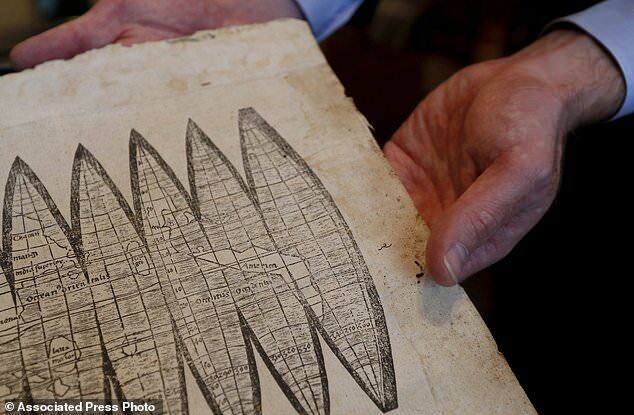 A copy of a 510-year-old map dubbed ‘America’s birth certificate’ because it gave the New World its name has been discovered by Christie’s auction house. 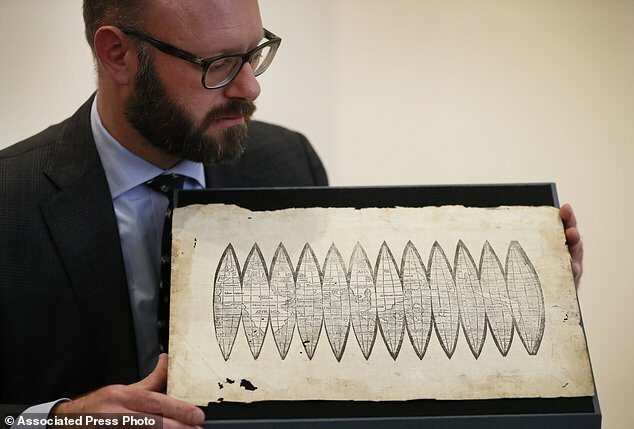 The two-dimensional globe was created in 1507 by pioneering German cartographer Martin Waldseemueller and could fetch £900,000 ($1.2 million) at auction. It is ‘the earliest piece of writing that uses the word America,’ Julian Wilson, a senior specialist in Christie’s books department, said. A wall-map version of the same chart by Waldseemueller, purchased by the Library of Congress for £7.6 million ($10 million) in 2003, has been called ‘America’s birth certificate,’ and Mr Wilson said the name equally applies to this version. The map is being sold by the family of British paper restorer Arthur Drescher. He died in 1986, but relatives only recently found it among his papers and took it to the auction house to be appraised. 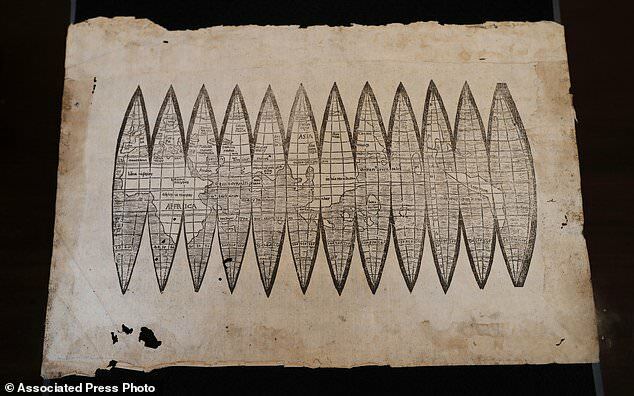 It is the oldest-known printed globe, designed to be cut out and pasted around a wooden ball. It is also the first map to show North and South America as separate continents and to depict a distinct Pacific Ocean, which no European had then seen. Waldseemueller was one of a group of cartographers based in Saint-Die, France that charted discoveries made by Spanish and Portuguese explorers and had access to the newest and most detailed information. ‘This is the first time that America is on the map, in more ways than one,’ he said. Waldseemueller named the landmass after Italian explorer Amerigo Vespucci, who helped show that lands being explored by Europeans in the 15th and 16th centuries were not – as Christopher Columbus initially surmised – part of Asia. 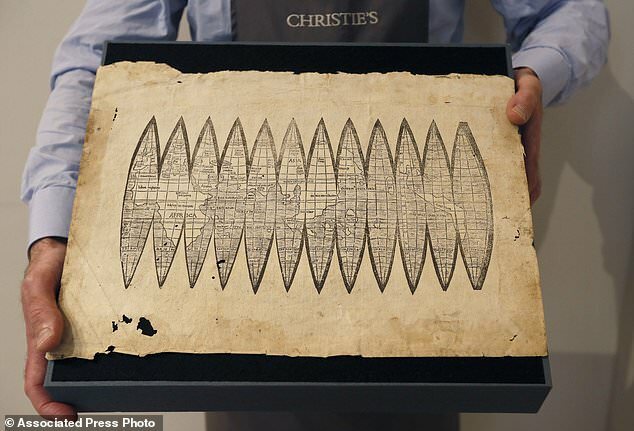 Christie’s plans to offer the map for sale in London Dec. 13, and it is estimated to fetch at between 600,000 pounds ($788,000) and 900,000 pounds ($1.2 million). Four other copies of the map exist in museums and private collections, but this one was previously unknown. 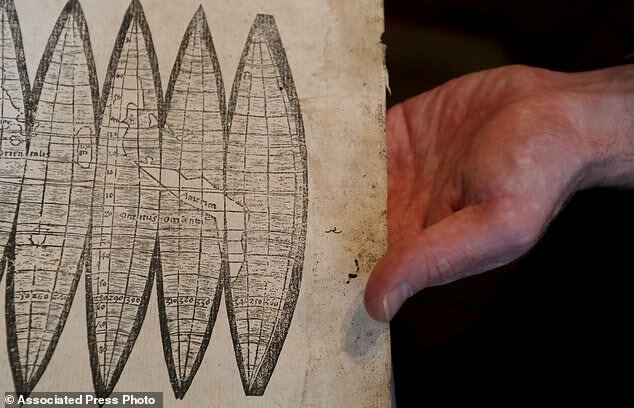 The map is the oldest-known printed globe, designed to be cut out and pasted around a wooden ball. Mr Wilson said the map is remarkably accurate. He said the map has ‘some quirks,’ including ‘a very large Sri Lanka and a very small India.’ Japan is placed in the mid-Pacific and Australia is missing. 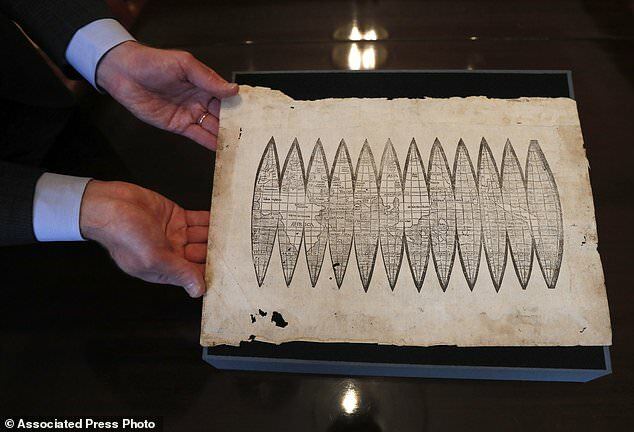 ‘But the major geo-political features of the globe that we would recognize today are for the first time visible on this piece of paper,’ Mr Wilson said. Mr Wilson said ‘it completely freaked me out’ when a man walked in off the street with the document. ‘My legs almost gave way,’ he said.